Going to the dentist is frequently a Trinity Beach family affair. At Trinity Beach Dental, Tony enjoys caring for patients of all ages. Early dental care can help children avoid unnecessary problems that could otherwise be prevented. During your child’s visits with us, we provide appropriate services to encourage healthy smiles and strong teeth. Exams and X-rays: Regular checks allow us to monitor the development of teeth and screen for early signs of decay. 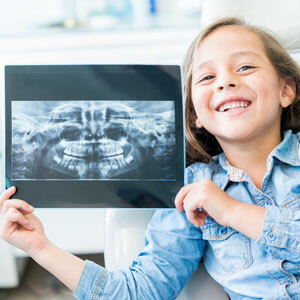 X-rays also show us the location and stage of tooth formation. Gentle Cleanings: Kids can get gum disease, too. Preventative cleanings help to keep young smiles healthy as they phase into an adult version. Protective Sealants: Combat cavities before they begin. Sealants block out bacteria in hard-to-clean areas like the deep grooves of back teeth. They take only a few minutes to apply (no numbing necessary). Fluoride: Strengthen weak tooth enamel with fluoride to make it more resistant to cavities. Oral Hygiene and Nutritional Counselling: Our team will talk to your child about keeping their teeth clean and making smart choices when it comes to their dietary habits. Fillings and Restorative Treatment: We recommend treating cavities as soon as they are diagnosed, to allow for the most minimally invasive therapy possible. Contact us today to schedule your children’s next dental checkup with our experienced family dentist.